This entry was going to be part of a longer one on which I was going to write also about brewing two different Porter beers, but since it could be too long and hard to read, I decided to make three shorter different entries. Inspiration for this first one came after watching an online video from Stone Brewing about one of their beers, Xocoveza. Actually, the video was more about the story of one of the ingredients of that beer, cocoa. In that video, Greg Koch, one of the co-founders of Stone Brewing, tells the story of cocoa used for Xocoveza, from its cultivation and production in Belize, until its processing in the Stone facilities and its addition during brewday. I thought it was pretty interesting, but it stayed there. 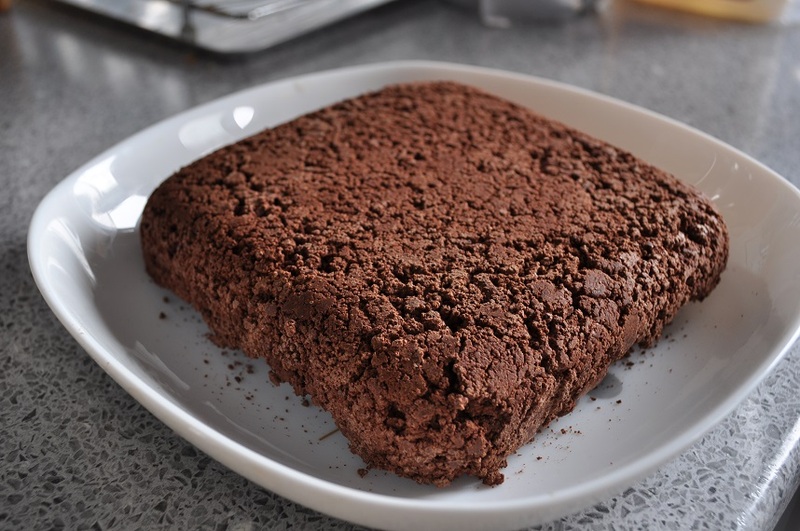 However, a few months later, I came across with another video, this time from a Spanish cooking blog, in which they described how to make home chocolate form raw cocoa beans. This new video made me remember the first one and I started thinking about the possibility of doing something similar at home. After wondering how it could be made for a while, I decided to do it, combining the information I thought was interesting from both videos. First thing I had to do was to find raw cocoa beans. It is not too difficult to find them, but they are not too easy to find either. Finally I found what I was looking for in a Portuguese online shop and, after ordering them, I received raw cocoa beans at home a few days later. However, a few weeks passed by until I was able to find some time to start with it. During those weeks, I researched some extra information about the matter and started to summarise what was useful from the videos I talked about. 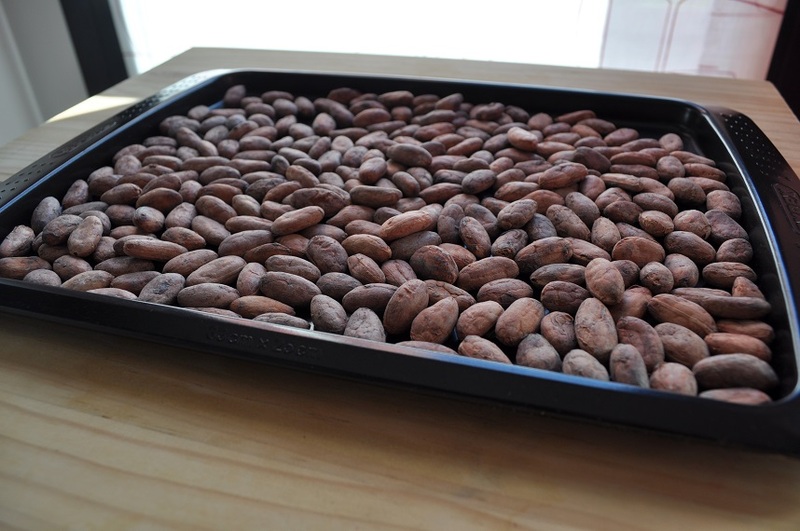 Firstly, I put 400 g (0.88 lbs) of raw cocoa beans on an oven tray, evenly distributed. I had previously set the oven at 120º-125ºC (248ºF-257ºF). Once that temperature was reached, I put the tray with the beans into the oven and I kept it there for one hour, spreading them after half an hour looking for a uniform roasting. Once the beans were roasted, it was time to peel them, one by one. You must be patient because it takes some time. Here, I regretted the fact that I was doing this all by myself without any help. With some of the beans it was easy to separate the hull from the nibs, but others required more time and effort. Probably roasting at a higher temperature would have been a better option to make the hulls more friable. However, being the first time I was doing this, I preferred to be conservative with roasting temperature and time. Precisely, one of the alleged advantages of this method is the versatility that gives playing with roasting time and temperature to get aromas and flavours as preferred. Next time I will probably keep the time of roasting but I will set the temperature a few degrees higher. Anyway, cocoa aroma in the kitchen was awesome, and flavour from the roasted and peeled beans (nibs) was very strong. Next step was to grind these nibs. To do this, I used the always reliable Corona mil which we used to mill grains before we bought a roller mill. 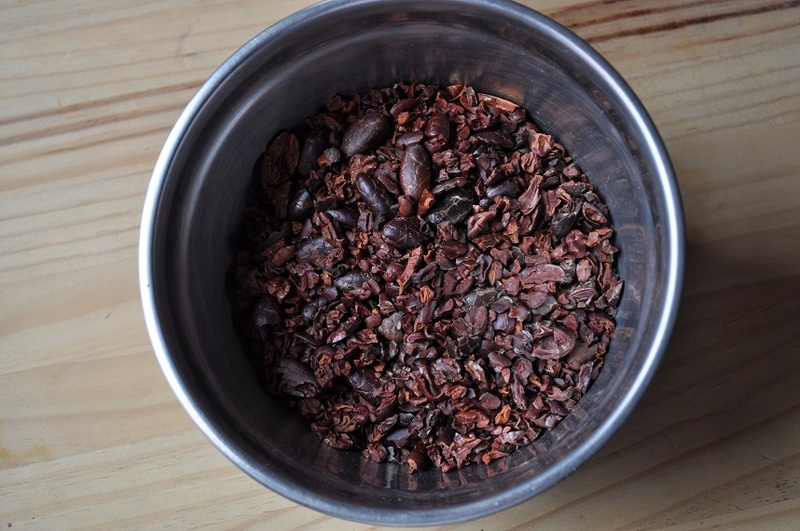 It should be taken into account that this step should be done with nibs at a warm temperature, since that way it is easier to form a cocoa paste. To get a suitable texture, I passed nibs three times through the mill, getting a soft cocoa paste as a result. I put this cocoa paste in a square shaped recipient used as a mould, which was kept in the fridge until next day to allow the cocoa paste to harden. Picture above shows the final result. From the 400 g (0.88 lbs) of raw cocoa beans I got a cocoa tablet of almost 300 g (0.66 lbs). So if you decide to try this at home one day, remember that you should account for a 25% weight loss during the process. As it could not have been otherwise, I took a little bit of this to taste it. It was quite bitter and full of cocoa flavour. In future entries we’ll tell you how we used it to brew two different Porters. I’m not going to deny it. Since I started homebrewing, every time I´ve had the opportunity of going on holiday, I´ve made some research on the local beers from the place I was going to visit and the pubs where I could drink them. This has become another attraction for those days. Of course, this also happened with the trip we made in October 2017 to Scotland, a country with a great brewing tradition. Among the beers we were able to taste, all of them of a considerable level, a few of them stood out. We enjoyed Long White Cloud, the flagship pale ale from the always reliable Tempest Brewing Co, we drank from cask and bottle Gold and Red from the little Skye brewery, from the island of the same name; and we liked very much Green Hopped IPA from Dark Star Brew, with fresh “green” hops infused during conditioning. 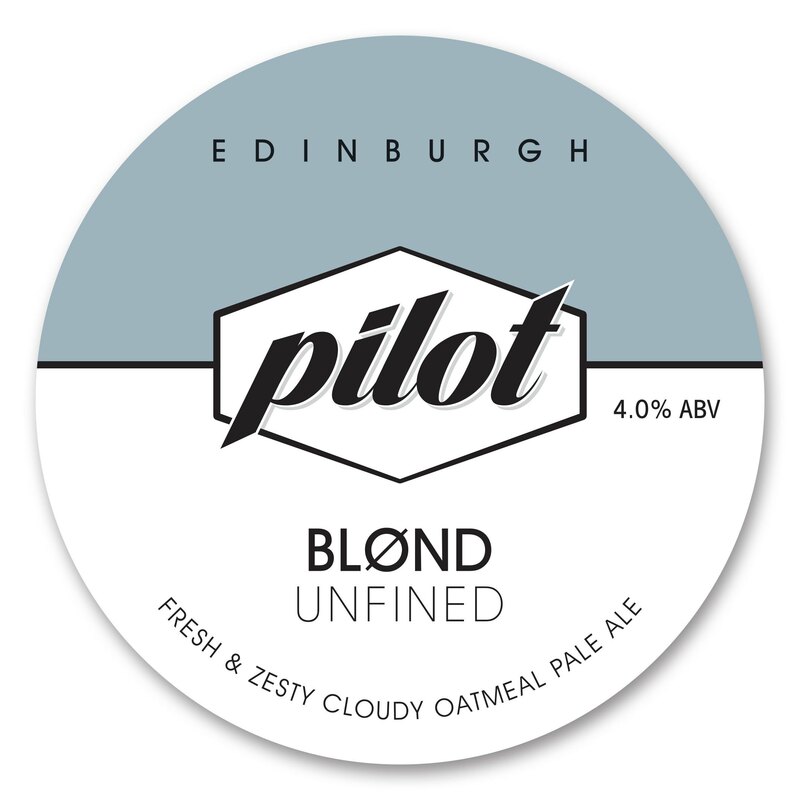 But if we had to choose one from all the beers we drank, we wouldn’t hesitate to pick Blønd from Pilot, a brewery from Leith, in the north of Edinburgh. We drank this beer for a dinner in a restaurant in Edinburgh and we loved it. Pale golden in color and quite hazy, it has a great tropical hop aroma and flavor, not too much bitterness and a really smooth mouthfeel. A beer to enjoy every sip. I looked for some information on brewery website and I found out that it was brewed with 50% of malted oats and that Amarillo and Galaxy were the hops used. I read also that it was only 4% ABV. Nowadays, this information has been removed from the website, I don’t know why, maybe a marketing decision. Once we got back home from holidays, and while I was planning the next beers we were going to brew I remembered this Pilot Blønd and we decided to brew, if not a clone, at least a version of it. Based on information from the brewery we started to work on a recipe. First thing we did was to buy some malted oats, something we had never brewed with before. In particular, we made an order for naked malted oats, that were going to be 50% of the grist for the recipe. For the other 50% of the grain, we chose Pilsen malt from Dingemans we had at hand. For the hops, we didn’t have Galaxy or Amarillo, so we chose to use two varieties we had an amount enough for this recipe, East Kent Goldings for bittering and Citra in whirlpool and dry hop. The next step was to pick a yeast. Some time ago we had ordered three sacchets of Vermont IPA from Giga Yeast, the first of which we had used to brew our first NEIPA. Being a liquid yeast we didn’t want to risk them to spoil, so we decided we were going use that yeast for this oat pale ale. Finally, we had to decide our water treatment. I will explain it later, but we wanted to have a mash pH around 5.30 and a ratio sulfate:chloride of 1:1. In the morning of the brewday we boiled about 18 liters (3.96 gallons) of water to evaporate chlorine. In the afternoon, we milled the grain and we added 50 mL of sulfuric acid 1 N and about 12 mL of 33% of calcium chloride to adjust mash pH and get the water profile shown above. With the water heated at the corresponding temperature, we added the grain slowly, stirring continuously to prevent grain clumps. We put the lid on with the mash at a temperature of 69.8ºC (157.6ºF). We mashed for one hour, opening the lid after the first 30 minutes to stir the grain again. After one hour, the mash temperature had dropped to 65ºC (149ºF). We turn the induction plate on to raise the temperature to about 75ºC (167ºF) for the mash out, stirring one more time. We removed the bag with the grain and heated the wort to boil. We took a sample to measure the pre-boil gravity, 1.030, the same of the theoretical value. Half an hour into the boiling we added 30 g (1.06 oz) of East Kent Goldings for bittering and when the boil was finished we turned off heat and we added 50 g of Citra that smelled really great when opening the packet, something that it is not always the case. We kept these Citra hops for 15 minutes and the temperature of the wort went from 94ºC (201.2ºF) at the beginning to 87ºC (188.6ºF) at the end of that time. Then we remove hops and started to cool the wort with our cooper chiller, keeping the first liters of water to use them for cleaning. Since the tap water was quite cold (it was December), the wort reached 17.5ºC (63.5ºF) in a few minutes. We transferred the wort to an 11.5 liters (3 gallons) PET demijohn, which we shook to oxygenate wort as much as we could. Original gravity was lower than expected (1.038 vs 1.045) because the evaporation was lower than which we had planned. We pitched directly two sachets of Vermont Ale Yeast from Giga Yeast because they had some time and maybe one of them was not enough. As we had a gose we had previously brewed in the fermentation chamber at a different temperature that the one we wanted for our oat pale ale, we left the demijohn in a bathroom which a steady temperature of about 18ºC-19ºC (64.4ºF-66.2ºF). Next day, 20 hours after pitching yeast there were no signs of fermentation. Since the fermentation chamber was empty then, we put the demijohn in it, setting a temperature of 18.5ºC (65.3ºF). The activity in the airlock started slowly after 48 hours, increasing its intensity with time. Beer temperature was 19ºC (66.2ºF). 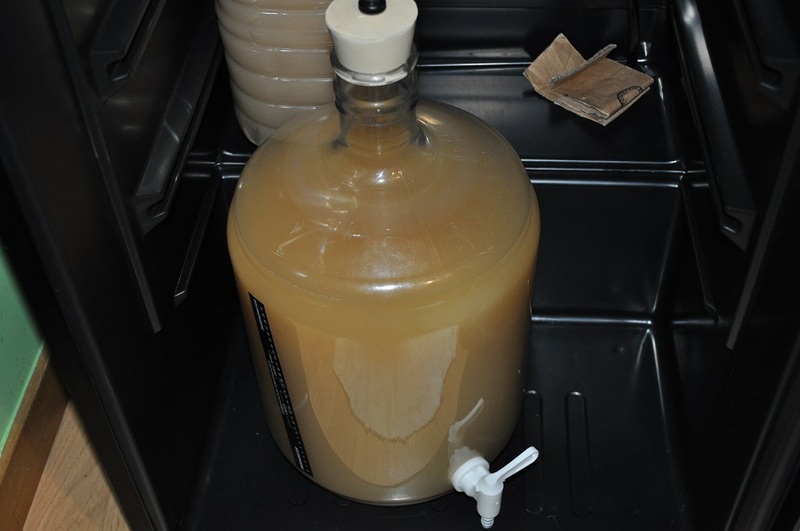 By the third day, the airlock activity was frantic and a thin krausen was forming. On the fourth day the airlock activity was almost nonexistent and the krausen was gone. After another two days without apparent activity we added the dry hop charge, 50 g (1.76 oz) of Citra pellest that still smelled like heaven, which gave us hope that this beer would result in something good. 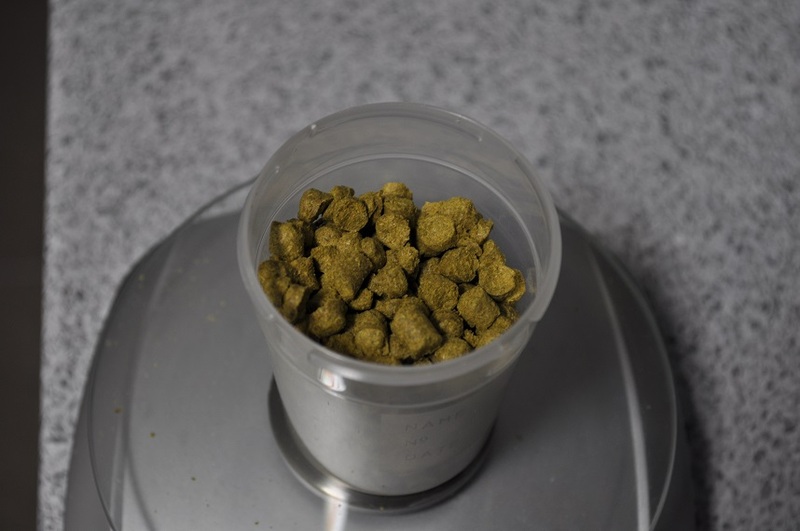 Four days later we removed hops and we lower the temperature gradually for 48 hours until it reached 15ºC (59ºF), to clear the beer somehow, although the great amount of malted oats as well as the hops used for dry hop kept the beer with a hazy appearance at that point. This haziness was something characteristic of the beer we were trying to emulate, so no worries. 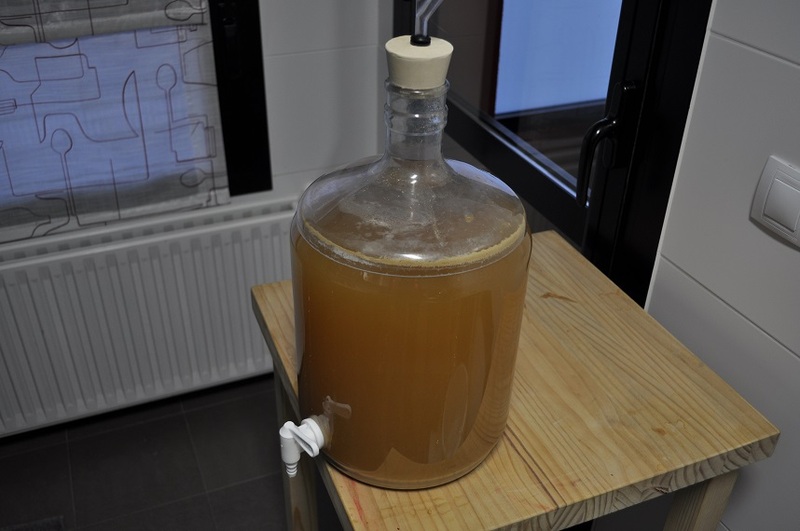 After three days at 15ºC (59ºF), in the morning of that day we removed the demijohn from the fermentation chamber and we left it in the kitchen to bottle in the afternoon. Final gravity was 1.016, a little bit high (our NEIPA with the same yeast finished at 1.015), with a final ABV of 2.9%. A value a little off from the one we had planned, but nothing to worry about. We added sugar, boiled with a little water and cooled, enough to get about 2.4 volumes of CO2 and we bottled around 9.24 liters (2.44 gallons), 28 bottles of 33 cL. While we were bottling, we took a sample to taste it and it had a really good aroma from dry hopping, as well as a nice flavor, with a nice clean bitterness. This made us be optimistic regarding the final result, once the beer was carbonated. At bottling, the look of the beer was very similar to Blønd from Pilot Beer. In a next entry we will talk about how the beer turned out and if it met our expectations. 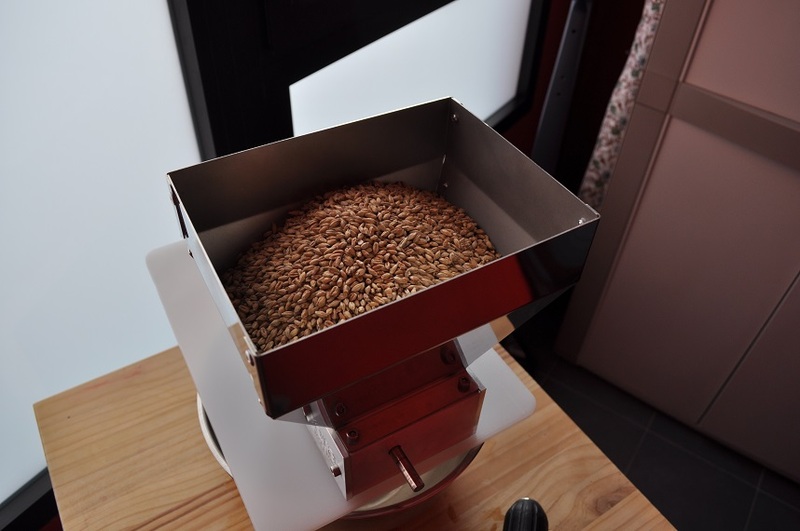 Those of you who are regular readers of this blog may already know that, once in a while, we use spent grain from brewdays as an ingredient in some cooking recipes. Specifically, we already told you how to cook a veggie burger with spent grain. In that entry you have all the information you need to dry and store your spent grain. Once the grain is dry you have two options. One is to keep it without further processing and another one is to mill the grain to get a spent grain flour. 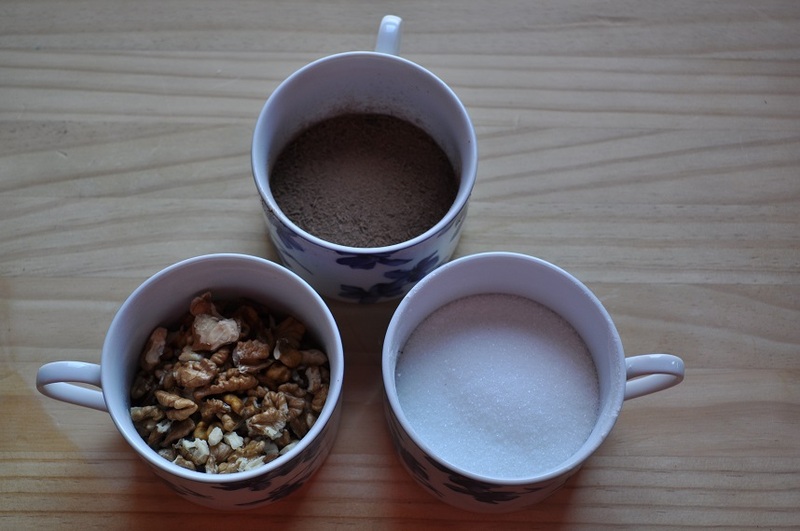 This last option is the one we needed for the recipe we are about to tell you about, a spent grain walnut biscotti. It is something between a sponge cake and a biscuit. To mill the dry grain we used a Corona mill. The base of this recipe are the two types of flour, from wheat and spent grain, in equal amounts. 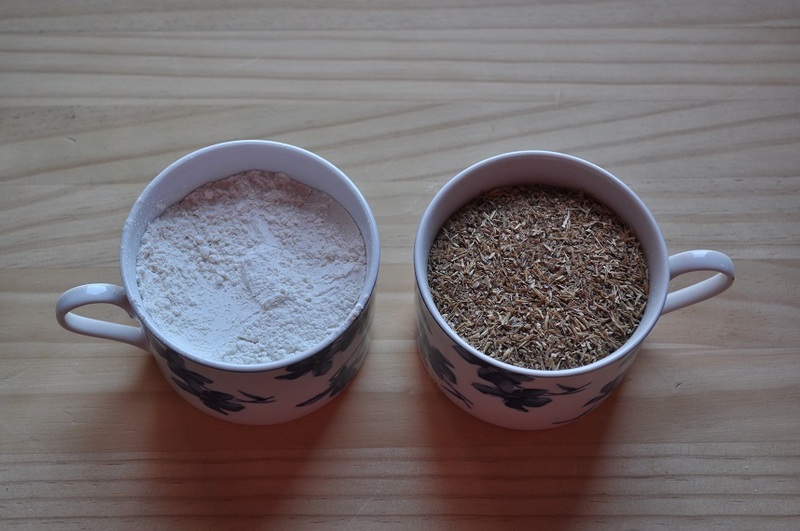 Both are mixed in a bowl with a pich of salt and baking powder. Apart from this, sugar, butter and orange liqueur are mixed in a blender. Once these ingredients are well mixed, add and beat an egg at a time. Next, add the mix of flours to the blender in thirds, beating between additions until blended to form the dough. Finally, to finish the dough, add sliced walnuts and chopped chocolate, mixing well with your hands or a spatula. Once you have the dough, form a log with it and wrap in plastic wrap to put it the freezer for an hour. 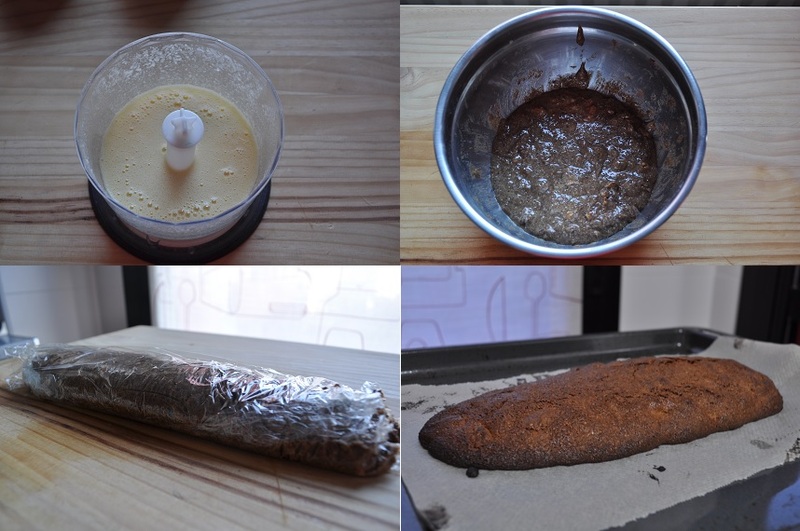 After this time, remove loaf from the freezer and preheat the oven at 180ºC (356ºF). Once this target temperature is reached, put the loaf in the oven on a baking parchment and bake for 30 minutes. Then, remove it from oven and let it cool for another 30 minutes. Finally, reduce oven temperature to 120ºC (248ºF), cut loaf into 1.0-1.5 cm (0.5 inches) thick slices, put them again into the oven and bake for additional 20-30 minutes. Be careful when making slices so they don’t break into pieces. I’ve cooked this recipe several times and it is very tasty, eaten for breakfast or for dessert. The fact of being baked twice and spent grain flour give it a very interesting texture. Also, chocolate, orange liqueur and walnuts make a very nice mix of flavours. I guess you could try this recipe without spent grain flour, but I doubt the result would be so good. 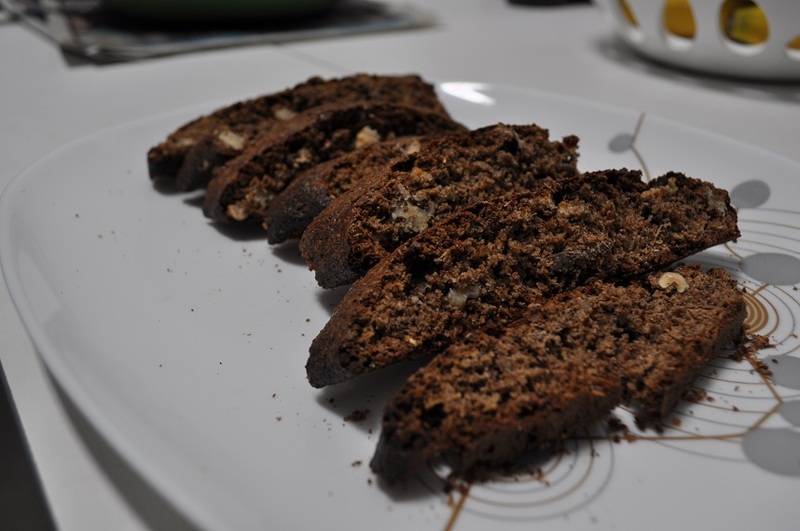 I encourage you to cook this biscotti, in my opinion, is a safe bet. Furthermore, you can keep it for example in a glass jar for at least a week without problems. If you decide to cook it, please share your experience with us. And if you have any doubt, don’t hesitate to post them in the comments section. After posting with the entries about our trip to Western Germany, where we visited Cologne and Dussseldorf to taste their famous beer styles, it is the turn for the tasting of one of our beers with which we tried to recreate one of those beer styles, a kölsch we already told you about its elaboration in this post. 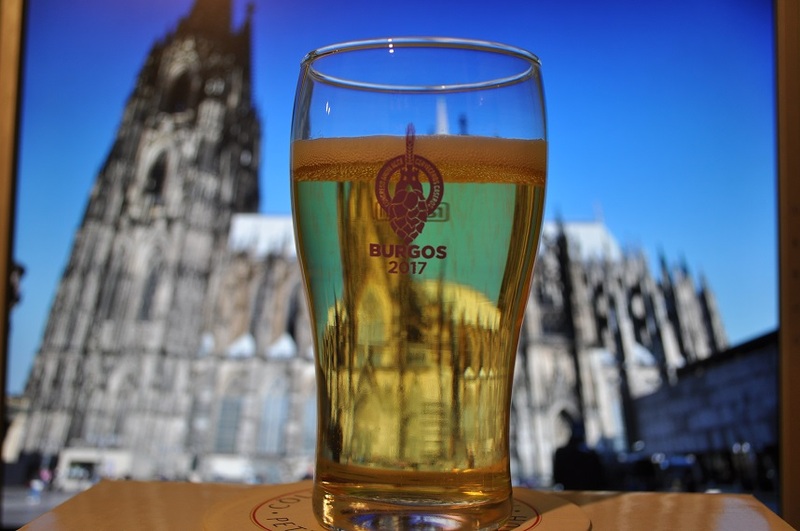 In terms of appearance, the Kölsch 2017 is up to par with the ones we could taste in our trip to Cologne. With a nice golden colour, it’s crystal clear as you can see in the above picture, and a white head of medium persistence. In respect to the clarity of the beer, as you could see in our post about brewing this kölsch, we didn’t add any fining or clarifying agent during all the process. This confirm us that to get a good clarity the key is time, something you can shorten with low temperatures, not being strictly necessary to add any other substances to fine or clarify (irish mosh, gelatin,…). Before commenting aroma and flavor, a quick note. 17 days after bottling the beer, with enough time to carbonate, we put all the bottles in the fridge and that same day we open the first bottle due to the “homebrewer yearning” sickness. Well, this first bottle, remember it has been only about 3 hours in the fridge, had a considerable sulfide aroma and flavor. 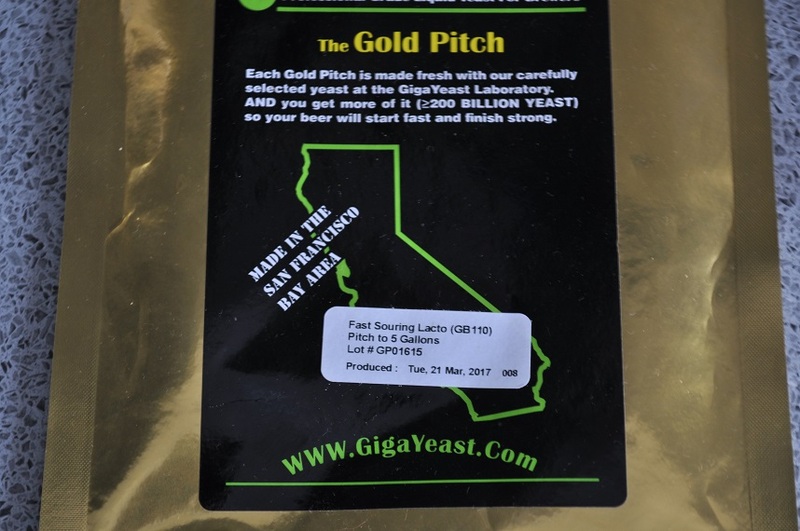 The information about the yeast we used in the Giga Yeast website says that this particular strain produces a moderate amount of sulfide… that luckily will dissipate completely with time. So we left the bottles in the fridge, at about 6ºC (42.8ºF), for 3 weeks before opening another bottle. Take this into account if you use this strain to brew a kölsch. After this time in cold storage, there was no trace of sulfide in the aroma. Instead, a nice subtle fresh hop aroma was present. Carbonation was medim-high, with a crisp finish. In terms of flavor, sulfide is also gone, and malt and hops are in a very nice balance with a subtle fruity touch and low-medium bitterness. All of this, plus the fact that it is clean and dry, make it a very drinkable beer. We had enjoyed it very much, but it had changed for the worse through time, losing hop aroma and flavour, and with an unidentified strange flavour that we don’t know where it comes from. We are glad with the results, although evidently it is not in the same level as the wonderful kölsch you can taste in Cologne. However, we consider it a good approximation. For those of you interested in brewing it, you must remember the thing with the sulfide if you plan to use the same or other similar strain (time and patience) and try to drink it as fresh as possible because, at least the one we brewed, it doesn’t stand well the test of time. We will probably brew this style in the future due to the fact that it is a very drinkable beer and we like it a lot. 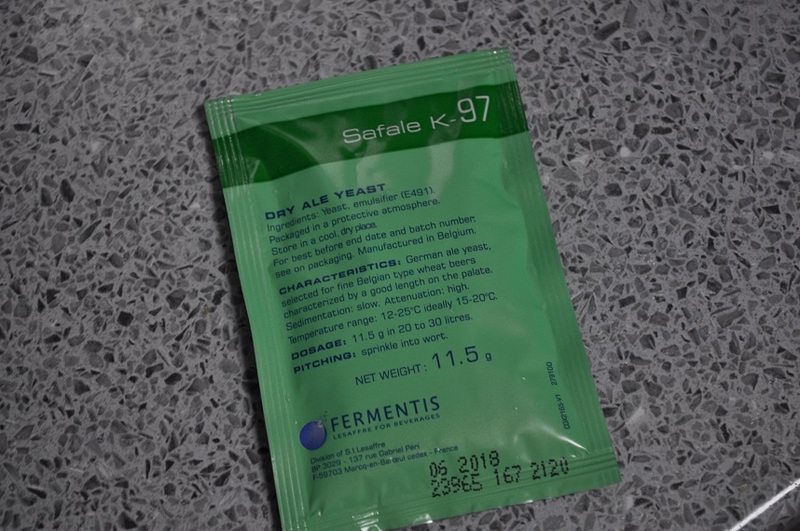 We won’t make a lot of changes with grains and hops, but we will maybe play with other yeast strains, for example Fermentis K-97, that left us a very good impression in our gose with apricots (the post about the tasting of this beer will arrive soon). 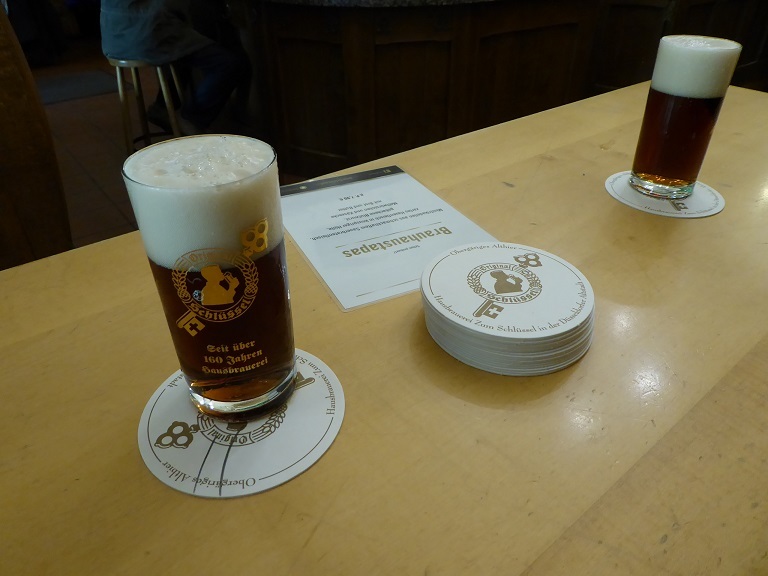 After the first part about Cologne and its Kölsch, we resume our trip to the west of Germany last autumn with the second part, dedicated to Dusseldorf and its reference beer style, Altbier. As we made with the first entry on the trip, first we’ll give you some notes and impressions about the city. Then, we’ll focus on beer, describing the general characteristics of the beer style and expressing our opinion on the different Altbier we were able to enjoy during our day in this city. Located about 20-30 minutes from Cologne by train, depending on the train you catch, Dusseldorf seems to be a quiet and modern city, maybe with a little less tourism than Cologne, which doesn’t mean that you are not going to meet a lot of visitors walking through the Altstadt, the old town of the city. Although Dusseldorf doesn’t have a magnet for tourists like the cathedral of Cologne, the attractions of the city are distributed in several areas with the Rhin River as an axis of all of them. From its Altstadt, full of restaurants and picturesque corners, a walk near the river passing next to the tall television tower, sometimes the symbol of the city, to the old Dusseldorf harbour is a very pleasant experience. This old harbour, nowadays dismantled, has been restructured in an interesting mix of apartments and office buildings, including some apartment buildings designed by Frank Gehry and some other old buildings which has been restored even with some pieces of modern art. It’s a pity that we could only spent a journey in the city, I’m sure there will be more opportunities to come back in the future. 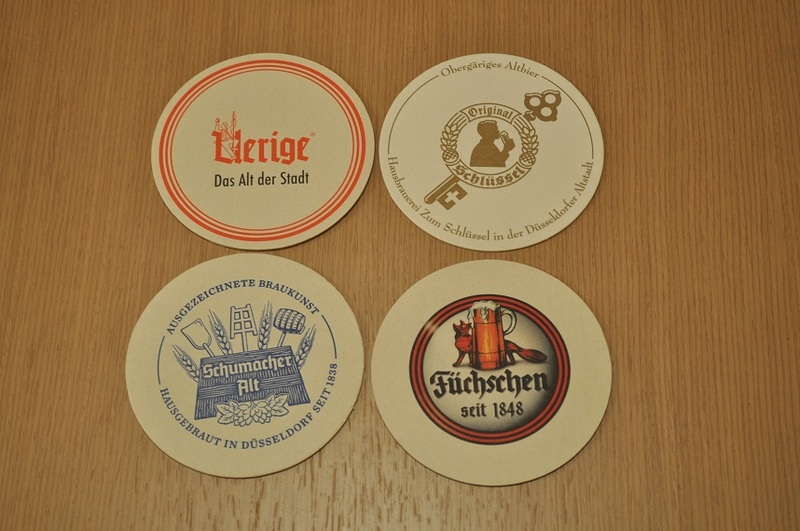 Coasters from the 4 brewery pubs we visited in Dusseldorf. Focusing now on beer, we got the impression that Altbier, although very prominent, it not as omnipresent as Kölsch in Cologne. This doesn’t mean that Altbier brewery pubs are not up to par with the ones in Cologne. There are similarities between both types, as the decoration and charm of all of them. The family atmosphere and the feeling of being regular gathering places are also common factors. With regard to beer, Altbier is a clean and usually dry beer, fermented with a specific ale yeast which is able to ferment vigorously at relatively low temperatures for ale strains. So far, more or less like Kölsch. However, you just need to take a look to one Altbier to notice the main difference between both beer styles. Altbier, with a light to dark amber colour, give more presence to malty flavours with the use of darker malts. Bitterness is variable and they don’t usually have hop aroma. 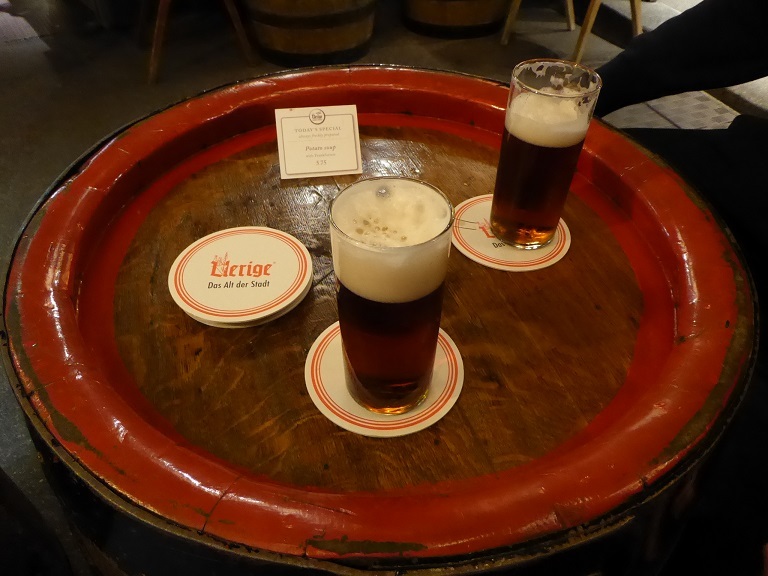 As with Kölsch in the nearby city, it is usual for Altbier to be served by gravity from wooden casks, with servers replacing empty glasses for full glasses until you decide to stop, noting little marks on the coaster with the drinks consumed. The glass in which Altbier is served is also different from the traditional Stangen used to serve Kölsch, with a little more capacity, 25 cL. We don’t know if it is due to this extra volume, but the price of one glass of Altbier is slightly more expensive than one glass of Kölsch, around 1.90€-2.05€ depending on the place. The last part of this post is going to be dedicated to give descriptions and express my impressions about the beers we tasted and the traditional places where we drank them. As in the post with the first part of the trip, I’ve organized the beers from the ones I enjoyed most to the ones I enjoyed less. Anyway, I must say all of them were pretty good. Zum Schlüssel brewery was established in 1850 and nowadays is a subsidiary of a larger brewery located also in Düsseldorf, which in turn is owned by other larger German brewery, which itself is owned by the even larger Carlsberg Brewery in Denmark. As all of the Altbier breweries described here, the beer is brewed on premises. The brewery pub is located in the Altstadt and it is restrained, looking like a typical German brewery pub. The place is full of tables to drink standing up or, especially, seated. Its Altbier is dark amber in colour, clean and very malty, finishing with a very nice sweet touch that I loved. Schumacher is the oldest Altbier brewery in Dusseldorf, established in the Altstadt in 1838, although it moved to a more spacious place near the train station in 1871, leaving a smaller pub in the Altstadt. Schumacher is still an independent private company. The place is similar to the one from Schlüssel, maybe bigger and with more decoration, with hop plants and paintings about beer motives giving a nice view. Its Altbier is copper in colour, with some hop presence, clean and dry, similar to the one from Schlüssel but with a less sweet finish. Füchschen brewery looks like a restaurant more than the other places. Opened in 1848, it seems less spacious than others due to the fact that there is less space between tables. We had read about the food being good here, so this was the place we chose to regain strength. And we certainly did it! Satisfying and tasty dishes, good prices, totally recommended… if you are able to find a seat. Its Altbier is probably the lightest in colour of the four and it is similar to the two previous ones, being in middle of both. Sweeter than the one from Schumacher and less sweet than the one from Schlüssel, less bitter than the first and more bitter than the latter. It is, like all of them, a clean and easy to drink beer. 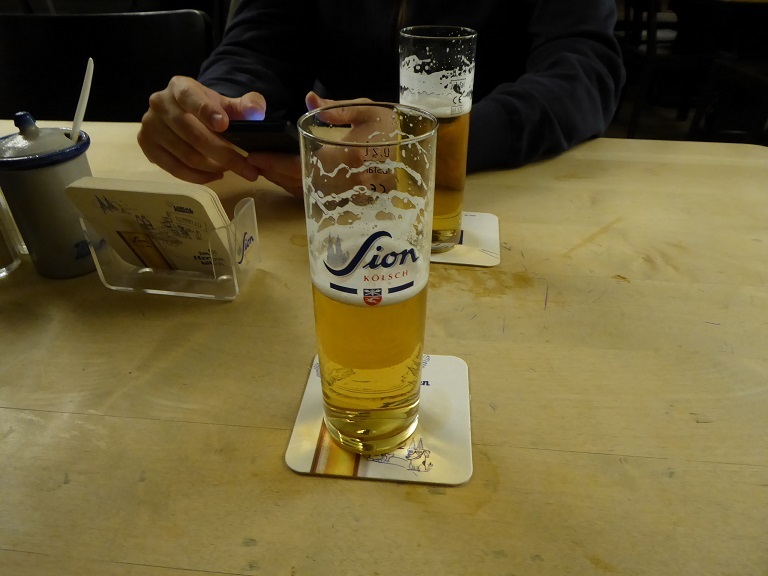 Uerige was our first stop to drink beer in Dusseldorf and we loved the place. Probable was the most beautiful of all the beer places we visited, including the ones in Cologne. This place is very charming and it exhales tradition. 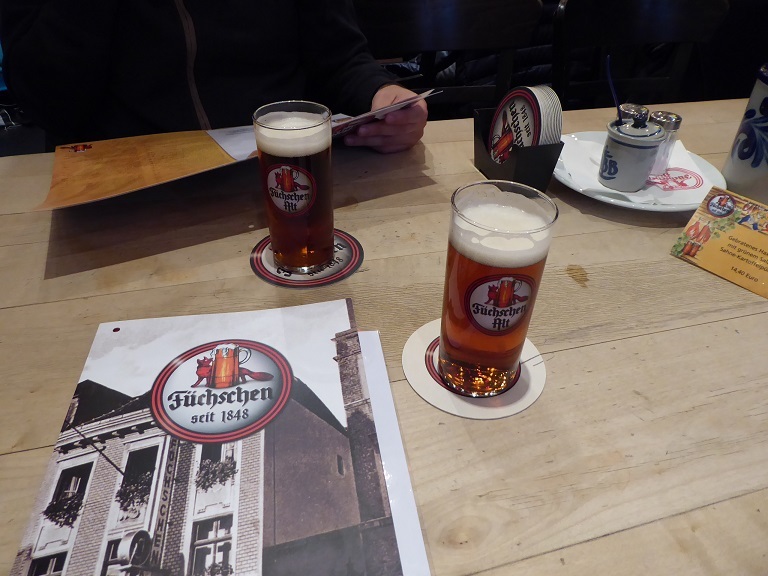 Regarding its beer, it is the most different of all the Altbier we tasted. It is by far the most bitter Altbier and it has some toasted touches probably from darker grains. It was the Altbier I enjoyed the less, but it could be possible that the fact that we were used to drink Kölsch the previous days had something to do with this. Anyway, an easy to drink beer, as all the previous ones. 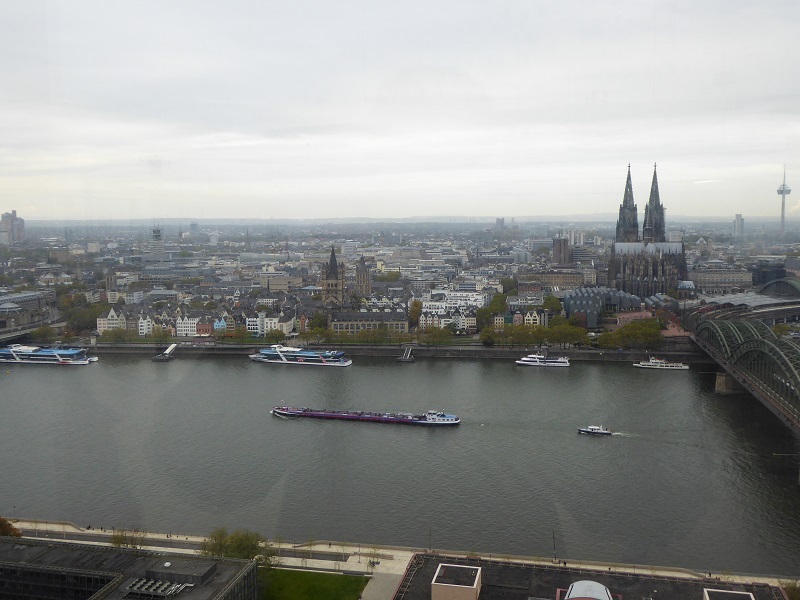 With this second part, we finished the story about our trip to Cologne and Dusseldorf. As a final note, I have only one more thing to say. No matter if you travel to Cologne or Dusseldorf, don’t miss the opportunity to visit the nearby city. Train connections are frequent and it doesn’t take a lot of time to travel from one city to the other. Both cities and their beers are worth the trip. Until next time. Prost! The day had come. Until now, through these last years all of our beers had been fermented exclusively with the reliable and classic Sacccharomyces cerevisae, a.k.a. beer yeast. Different strains, yes, some of them even quite peculiar, but always putting fermentation in the hands of the same species. However, the rise of sour beers in recent times made us to rethink the possibility of brewing one of these beers. First thing we had to face was to choose a style, since most of you will know, there are several styles of sour beers. Finally we decided to brew a Gose for several reasons: it is a relatively approachable style, it doesn’t take an eternity to brew and we really like the style, more than other sour beers like Berliner Weisse, Lambic or Flanders Red. Once we chose the style, we thought that we were also going to use some fruit for this beer, since Gose is a style that goes well with fruit and it is not unusual to see Gose beers brewed with different fruits. 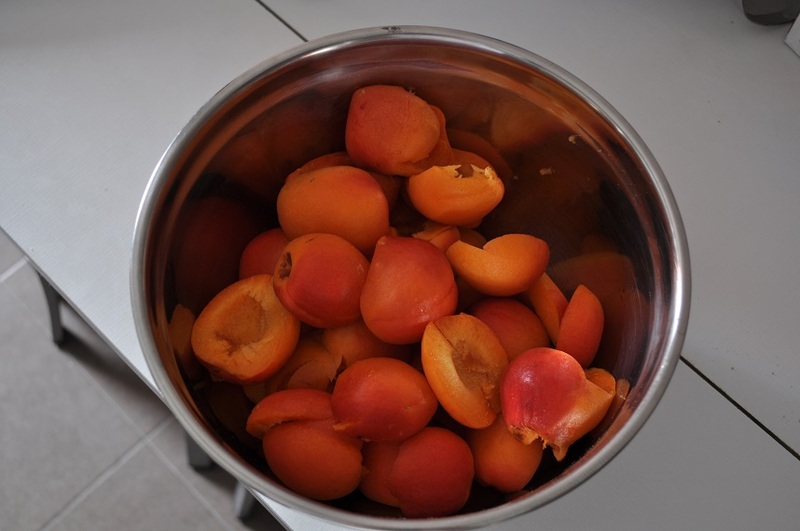 We decided we were going to use apricots this time, so the first thing we did was to buy some ripe apricots during their season. Then we made a purée with them and kept that purée in the freezer while we kept on reading information about the style and how to brew it. Since we brewed this beer in December 2017, the apricot purée spent 3 months in the freezer. First, as always, some notes about the style and its history. Gose is a pale wheat beer, top fermented and acidified via lactic fermentation. 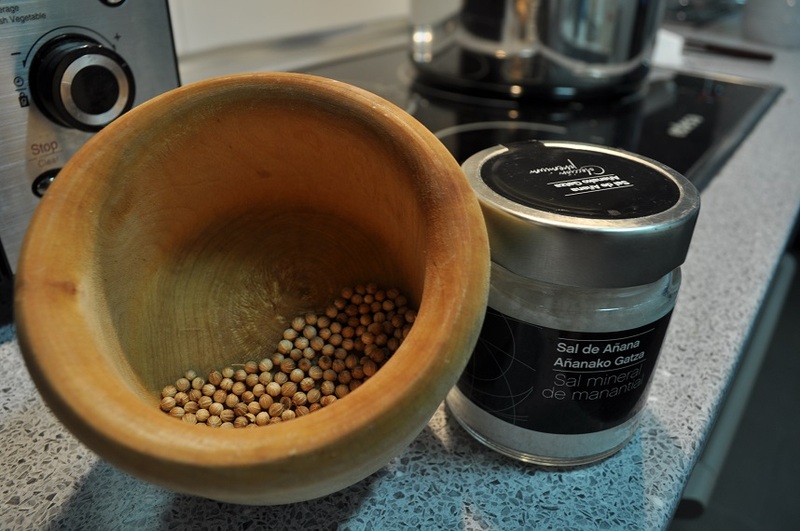 Sodium chloride (table salt) and coriander seeds are used as flavourings. It is usually brewed with barley malt and wheat, with the latter in a greater proportion in the grain bill. Gose was probably once a spontaneous fermented beer and sourer than today versions. The website of Ritterguts, the oldest brewery which still brews Gose contains some useful information about the style and you can even watch an interview where people from the brewery explain how they brew their Gose. Taking about its history, Gose maybe is one of the most interesting beer styles. I’m not going to detail it because some of you maybe aren’t interested in reading stories about beer. But for those of you who, like me, enjoy reading about the evolution of beer styles, nobody better than the excellent beer historian Ron Pattison to tell you about the history of Gose. However, I’ll give you some notes: first Gose was brewed in the beginning of the eighteenth century in Goslar, in the north of Germany, and it became famous in the next years in the nearby city of Leizpig, where at the end of the nineteenth century it was considered the local beer style. During the twentieth century its popularity declined, to the point that it almost disappeared. There was a revival in the 90s and now you can see how it turned out in your favourite bars. Focusing on brewing, first thing we had to think about was how we were going to acidify (lower the pH value) of the wort. One of the common ways to do this is to work with lactic acid producing bacteria like the ones from the Lactobacillus family, since they are easy to work with and they are not hard to get, as pure cultures or from the environment since they are present in most of the base malts. If you want to get a fast acidification, there are basically three methods to do it: acidifying in the mash (sour mashing), in the ketlle (kettle souring) or in the fermenter (sour worting). Each one has its own tips and characteristics to avoid troubles and if you want to learn more you can visit this entry from the Sour Beer Blog, where you can find a detailed description of each method as well as some tips to do it right. We chose kettle souring, I’ll explain the process later. We chose it for several reasons: it’s quick, it’s safe since it avoids cross contamination and it’s easily adjustable. Before getting into specifics about the process we followed, you can see below a description of the ingredients we used as well as a little summary of the steps of the process. The final volume was 5 liters (1.32 gallons), since everytime we try a new thing we like to start with small volumes. Ingredient selection was easy. For grains, following tradition, wheat malt and Pilsen malt, with the first in a greater proportion. This time wheat malt was from Grannaria, a malting plant in Leon that has increased the grains in its catalog this year. We bought from them because we liked the result we got with our Smash L&G. Pilsen malt was from Dingemans. The little amount of hops we needed came from Germany, Hallertauer Tradition. We also added as adjunts, also following the style guidelines, salt from Añana and coriander seeds, freshly crushed, both in the boil. To acidify we used Fast Souring Lacto from Giga Yeast and to finish fermentation a German strain from Fermentis, Safale K-97, a clean ale yeast. 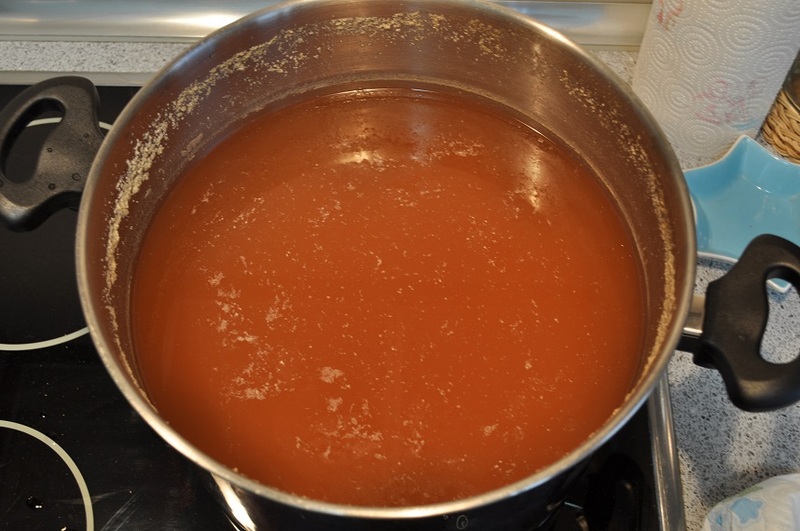 In the process, new for us, we followed again the advice from the Sour Beer Blog to avoid growth of unwanted microorganisms and/or contamination with Lactobacillus in the cold side of the process. The steps to follow to avoid complications start after mashing. At this point, you boil the wort for 15 minutes to sanitize and kill as many microorganisms as you can. Then, you cool the wort until it reaches around 40ºC (104ºF), a suitable temperature for Lactobacillus (it depends on the strain), and you add enough phosphoric acid or lactic acid to lower the pH to a value of around 4.5. After that, you pitch Lactobacillus and let it ferment, trying to keep the temperature in a suitable range, around 30ºC-40ºC (86ºF-104ºF). It is also advisable to keep oxygen apart, so it is a good practice to purge with CO2 when pitching Lactobacillus to avoid some undesirable byproducts. Finally, when the wort reaches the pH value you are looking for, you boil it as if it were a normal wort for the time you want, adding the hops you want and from then on you keep on as you would do with other beers. Following these steps, you practically avoid growth of unwanted microorganisms, off flavors and contamination of your equipment with Lactobacillus in the cold side of the process. Next day, 21 hours after pitching Lactobacillus, the pH value was 4.50. The kettle had lost temperature, so we heated it until the wort reached again 40ºC (104ºF) and we put it again in the fermentation chamber, this time with a towel around it to try to avoid heat loss and facilitate the growth of Lactobacillus. A day later, 48 hours after inoculation of Lactobacillus, the pH value was 3.55, just in the middle of the recommended range (3.3-3.8), so we proceeded to boil the wort. Pre-boil gravity was 1.029, giving an attenuation of 11.8%. The theoretical value for this culture described in the Giga Yeast website is 15% fermenting at 37ºC (98.6ºF) for 48 hours, so having into account that our average temperature was lower than that, it was not bad at all. We added hops 45 minutes before the end of the boil, and the last 5 minutes we also added 3 g (0.11 oz) of salt and 3 g (0.11 oz) of freshly crushed coriander seeds. When the boil was finished, we cooled the wort until it reached 20ºC (68ºF) and we pitched Safale K-97 looking for a clean fermentation, setting the fermentation chamber at 18.5ºC (65.3ºF). 23 hours later a considerable krausen was present and it made us forget about our fears of the yeast not being able to work with a low pH value. After three days, the krausen was gone and fermentation seemed to be reaching its final stages. Nevertheless, we left it another 3 days before adding the apricot purée that we had kept in the freezer for three months. Obviously, we kept it outside of the freezer a few hours so it was a little below room temperature when we added it. Final gravity was 1.008, for 4.2% ABV. Before adding the fruit I took a sip and it tasted pretty nice, with a marked but pleasant acidity. Sugars from the fruit reactivated the yeast, and next day the airlock looked like a volcano, full of fruit, as well as the top of the fermentation chamber as you can see in picture below. After a couple of days and various changes of airlock everything settled down and the fruit started to fall to the bottom of the PET bottle. 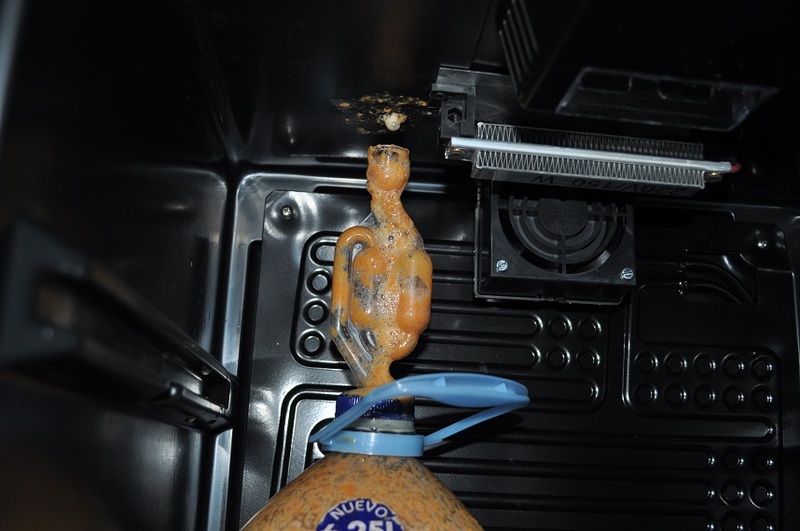 Twelve days after adding the apricot purée, we transferred again the beer to a smaller PET bottle trying to clear it. Finally, the second day of 2018 we bottled the beer adding enough sugar to get around 2.6 volumes of CO2 in the final beer. We had certain difficulties because there was still a lot of fruit in it and it was difficult to separate it from the beer, even using some cloth filters. We ended up with around 4 liters of beer with about 4% ABV that filled 12 bottles of 33 cL, left at room temperature to carbonate for at least 2-3 weeks. As a final summary, and before commenting how the beer turned out, something we’ll do in a future post, I must say that brewing our first sour beer was a very interesting experience. We forgot our fears about “bugs” and this sour beer will be followed by others. The steps to avoid complications when brewing this style are not difficult to follow and the possibilities are endless (different yeast/bacteria strains, other types of fruit,…). However, for future elaborations of beers similar to this, we had to think about the way of adding fruit so we can separate this fruit from the final beer. Maybe we can try putting the fruit in stockings or maybe we can brew a bigger volume and give more time for the fruit to settle down at the bottom of the fermenter (this time we rushed everything because we were looking forward to taste the final result). For those of you who haven’t brewed sour beers yet, we encourage you to forget your fears and do it since, as you can see, it’s not so complicated and you can get good results without having to wait a lot of time. And for those of you who already brew sour beers, we are all ears if you want to share some tips with us. As we told you in our post about brewing our Kölsch 2017, last November we were able to spend a few days in Cologne, and also to visit the nearby Dusseldorf. As every good beer aficionado will know these two cities are the cradle of two peculiar beer styles, Kölsch and Altbier, respectively. To make it easier, and also because we don’t want to choose one side in the regional rivalry about beer between these two cities, we are going to divide our trip in two parts. First one will be about Kölschs from Cologne and the second one will be about Dusseldorf and Atlbiers. First, and as a non-beer introduction, a few tourist tips about the city. It is clear that its majestic cathedral is the center of everything with its tourist magnetism. It can be seen from a lot of places around the city and it impresses with its enormous size. Apart from its outward appearance, its interior deserves to be visited with tranquility. You can also climb the stairs to one of its towers for spectacular views of the city. Apart from the cathedral, Cologne is, at least the most touristic area, a good city for walking. It is a pleasure to walk around its Altstadt or along the banks of the Rhine river. It is also interesting to leave the city center and explore further areas while visiting the old doors of the city. A friendly city, totally recommended for a short trip. 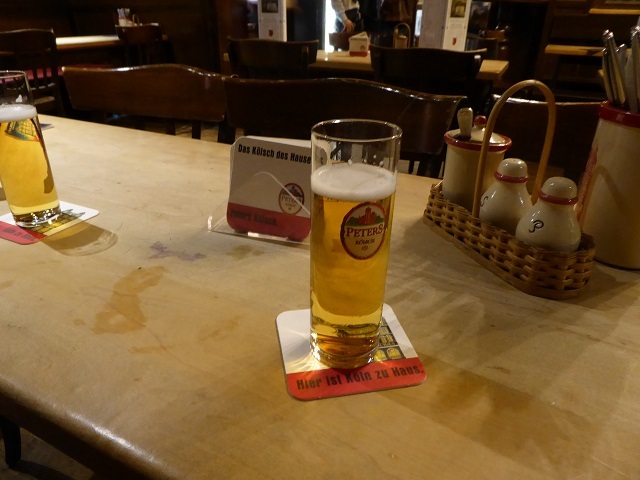 Time for the beer, Kölsch in this case, that of course is another attraction to visit Cologne. After arrival, once you start wandering the streets, you notice that beer culture in this city is big. There are logos from the different Kölsch breweries everywhere. And when you step into any of the huge brewery pubs owned but the breweries all of this is confirmed. Almost any time of the day there is a great atmosphere in these places, being especially lively at lunch and dinner time. People of all ages sitting around tables having a good time, from teenagers groups to entire families, grandparents and grandchildren included. And everybody in a perfect (but noisy) harmony, without any trouble in spite of the liters of beer consumed. As we told you in our post about brewing a Kölsch, this beer is served in 20 cL glasses known as Stangen. These recipients showcase the clarity of the beer and help sustain the characteristic white head of Kölsch. Kölsch is usually dispensed from wooden casks and you don’t really need to order one, unless you want to order something different from beer. Servers (known as kobes) go from one site of the pub to another with a special tray full of glasses with beer replacing empty glasses from the tables. 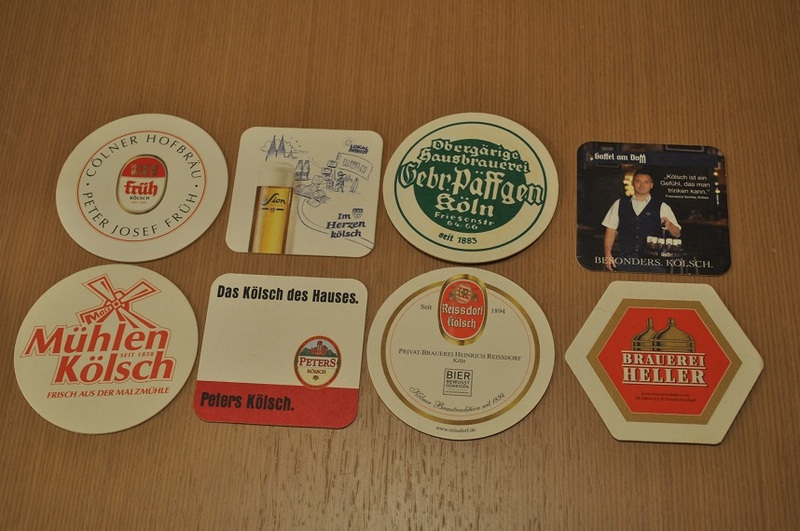 To keep track of the beers consumed, servers mark a coaster with a slash for every glass they serve. If you don’t want to drink anymore, tradition tells that you should put your coaster atop the glass. At the end, based on the slashes on the coaster, you pay the corresponding price. If you feel hungry, you can also taste the German gastronomy in these pubs. Beer prices are similar among the different brewery pubs and, if I remember correctly, a glass is about 1.70-1.80€. For the last part of the post, I’ll make a description about the different beers we tasted and how I felt about them. I’ll also describe the brewery pubs, at least what I remember about them. I’ve organized the beers from the ones I enjoyed most to the ones I enjoyed less, but it’s only a matter of personal taste, nothing to do with their quality. Kölsch from Malzmühle was the one I enjoyed most. The brewery pub, situated a little bit off from the city center, is a cozy place, smaller than the rest of the brewhouses we visited. It is one of the few to have the brewery on site. With a traditional decoration, we didn’t eat here, but we loved the beer. 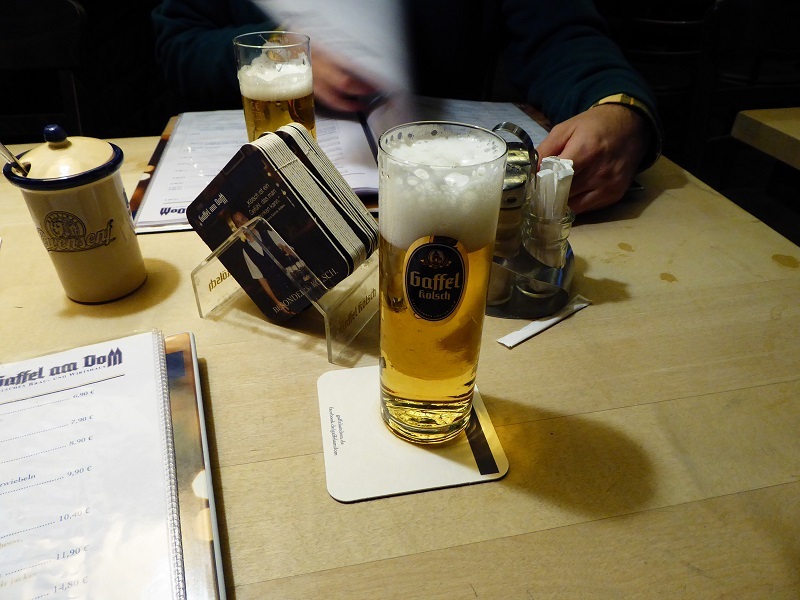 It is the maltiest Kölsch among the ones we drank, very tasty and with a final hop touch that makes it perfect. As every other Kölsch, it is a very clean and dry beer. Päffgen was established in 1883, and their brewery pub is also away from the city centre, but the walk is worth it. Unlike Malzmühle, it is distributed in big and long halls. We had lunch here, including one of their famous specialties, a 75 cm sausage, excellent to recover some strength while drinking their Kölsch, a truly delight. In this case, hops are the ones which shine, in aroma as well as in flavor. It is a very well balance beer, probably the easiest to drink. 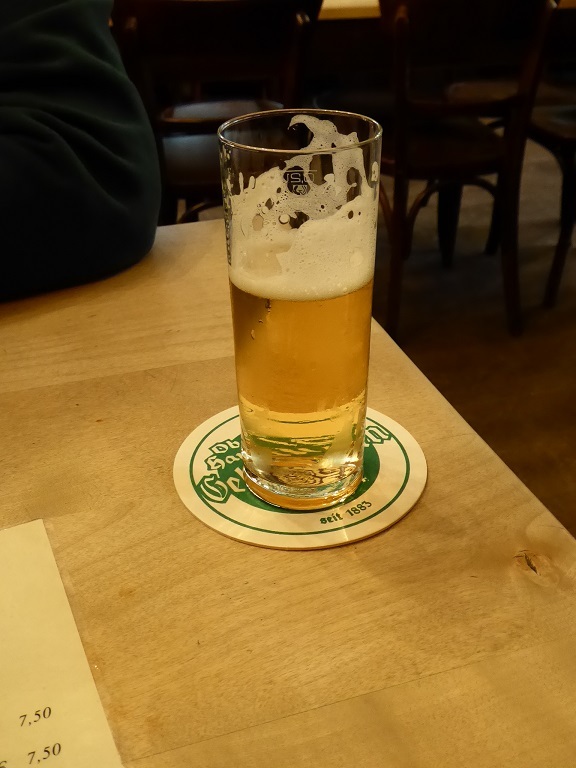 Here you realize the importance of drinking this style of beer fresh and why it is almost impossible to drink a great Kölsch outside Cologne. Peters is maybe one of the most beautiful pubs in Cologne. Similar to Malzmühle, although in this case beer is brewed off-premises. It is a very cozy and welcoming place, with a lot of rooms not as big as in other pubs. It is also located right in the Altstadt. Their Kölsch is pretty good: not too malty, with subtle notes from the hops,… a beer to drink in large volumes. A truly giant. Among the Kölsch league, that is how you can describe Früh. It is, with Gaffel and Reissdorf, one of the few breweries which export their beer, brewed in a big facility in the outskirts of Cologne. Opened in 1904, their brewery pub is located a few meters from the cathedral in an impressive building that, in addition to its huge pub restaurant (with space for more than 1000 people!!!) also holds a hotel. Due to its location, it is almost constantly full of tourists drinking and eating in its countless rooms. This overcrowding make it lose some charm, but it is worth to visit it at less once to drink their Kölsch, similar to the ones from Peters or Gaffel. Balanced, with a nice hint of hops and maybe smoother than Gaffel’s. We had lunch here and both food and service were good, although a little bit more expensive than in other places. Another Kölsch monster brewery. Gaffel fights Früh the first place in pub presence in pubs all over Cologne. Their spectacular brewery pub Gaffel am Dom is located in front of the cathedral and it is huge, although unlike Früh, it is distributed in larger halls, what makes it appear more spacious. Despite its location, it has less tourists than Früh, with more local clients, at least when we were there. With typical German cuisine, we were having dinner one day here at ease in the middle of a great atmosphere. Their Kölsch, although in my opinion one point below the ones from Peters or Früh, it is very similar to these two, maybe a little less bitter. Clean, dry, with notes of hops in flavor and aroma, it was the first Kölsch we drank in Cologne (in another pub) and we liked it a lot. Hellers has farthest brewery pub of all, and it shows the most modern decoration. It is very long with a lot of smaller rooms and a beer garden. We were there when they were opening it in the afternoon and there were few people, but it was maybe not the right time. It is a welcoming place and they have something the rest of the breweries don’t have. 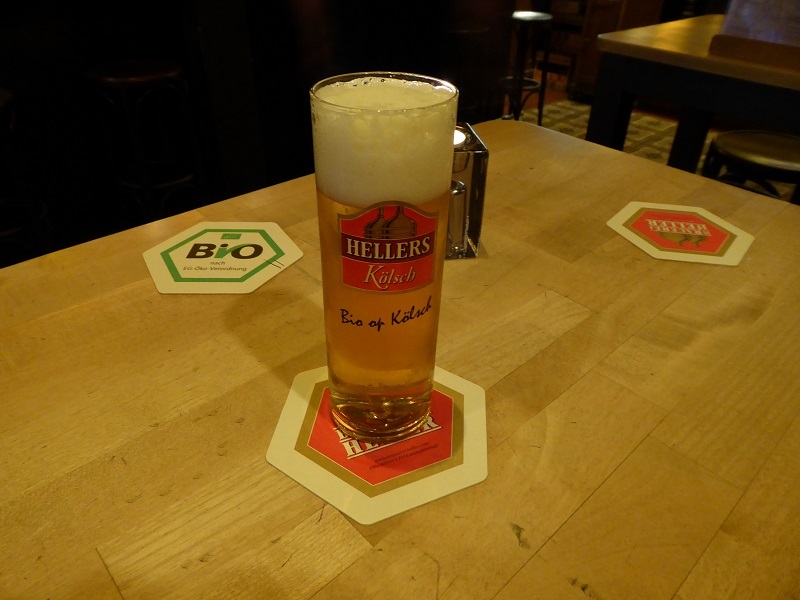 In Hellers, in addition to their Kölsch, they also brew other beer styles (Pils, Weizen, Mailbock,…). We didn’t taste them, maybe in another opportunity. Their Kölsch is malty, bitterer than the one at Malzmühle, and with little hop flavor. As any other Kölsch, very drinkable. Located in the Altstadt, Sion is what you have in your head when you imagine a German brewery pub. Huge halls full of tables with servers going from one place to another, in one of the largest brewery pubs of Cologne. With a great tradition, the brewery was founded in 1318, and now it seems to be under control of Interbrew. We didn’t eat anything here, but the menu looked good. Their Kölsch was too bitter for me and somewhat plain, with less shades than the previous beers I described above. 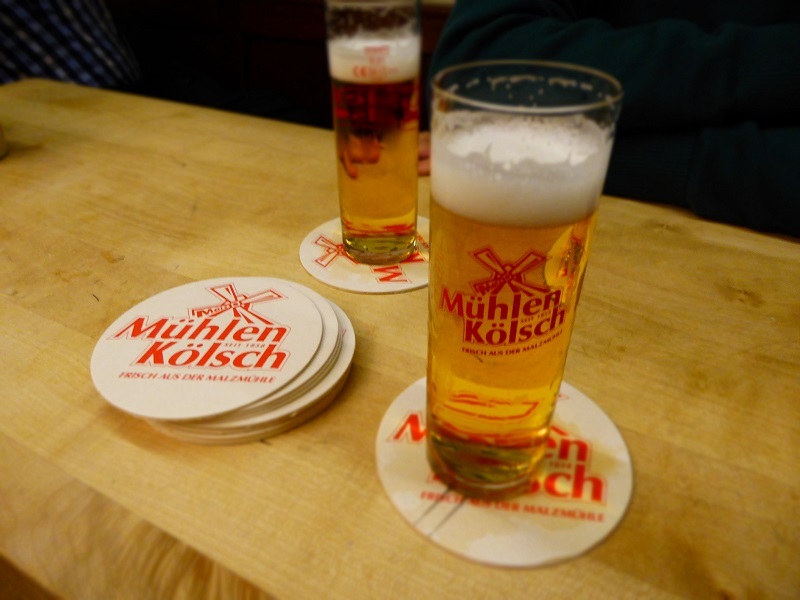 Of all the Kölsch we tasted, the one from Reissdorf was the only one that disappointed us. Their pub is probably the smallest of the ones we visited. In fact, when we were there, there was only one person serving the tables. It is away from the city centre and the food looked good, although we didn’t eat anything. This was the only place where the Kölsch wasn’t dispensed from wooden casks by gravity. They served us from tap (we couldn’t see where the taps were connected). 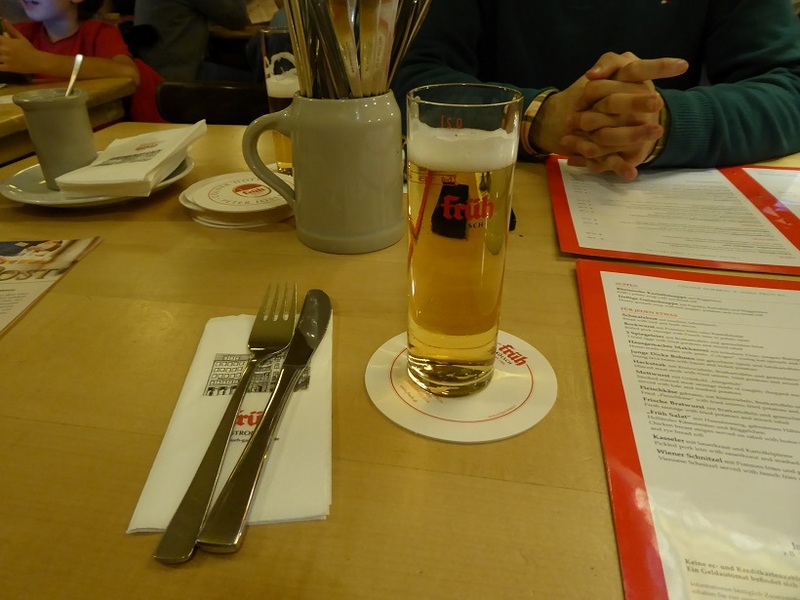 We thought it was too bland for a Kölsch and it reminded us more of a Pils. Well, that was my recap from Cologne and Kölsch. 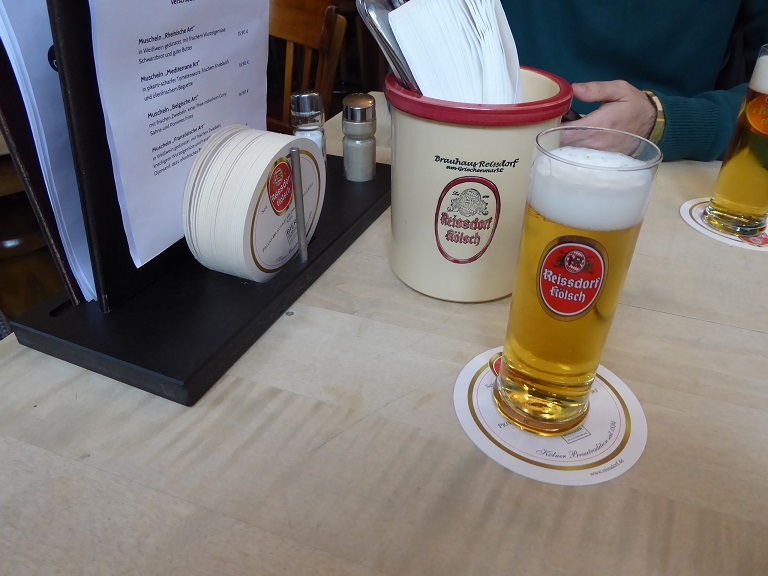 In a future post we’ll tell you about what we visited in Dusseldorf and the Altbiers we tasted, in the second part of our trip to Western Germany. If any of you had visited Cologne feel free to post your comments below about your favorite Kölsch. And for one of you who had not been to Cologne we hope this post helps you to plan your trip. Prost! Sour beer and brewing education for both home and craft brewers.